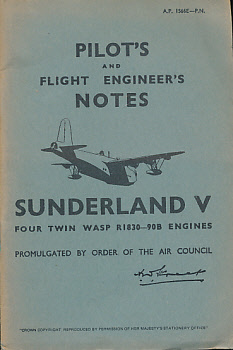 Barter Books : Air Ministry : Pilot's and Flight Engineer's Notes for Sunderland V. Four Twin Wasp R1830-90B Engines. B/W diagrams and fold out illustrations at rear. 190 x 130 mm (7 x 5 inches) - 46pp. G : in Good condition without dust jacket. Cover rubbed and faded.